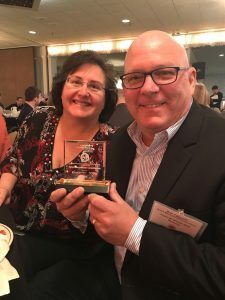 Agawam, MA – On October 26th Notch was presented a Springfield Regional Chamber 2018 “Super 60” Award at the annual celebration event at Chez Josef. This is the second year in a row that Notch has received a Super 60 award. To be considered, companies must be based in Hampden or Hampshire counties or be a member of the Springfield Regional Chamber, be an independent and privately owned company, and be in business at least three full years. Companies are selected based on their percentage of revenue growth over a full three-year period or total revenues for the latest fiscal year. Notch qualified for both categories. “The success of this year’s winners is a clear indication that our regional economy is strong and reflects the diverse nature of our industries,” said Springfield Regional Chamber President Nancy F. Creed. This esteemed award is presented annually to the top businesses in the region which continue to make significant contributions to the strength of the regional economy. Notch employees Sharon Orr, Ken Tyburski, Melissa Peters, and Susan Rose attended the event to accept the award.